School is back, which means our nation's motivational speakers are polishing their presentations to enthrall and inspire students across the land. These earnest TED Talker types — educators, athletes, activists — have touching and triumphant stories to share with young people, usually trafficking in beautiful abstractions about Hard Work and Believing In Yourself and other tropes of this tattered but durable thing we call the American Dream. I remember many such visitors to my public high school, long ago in Mississippi. One had been a Chicago Bear, another in the U.S. Navy. I fondly remember one who seemed a little angry — a progressive choice, we thought, for an inspirational speaker. The man wore a haunted visage. He had seen some ugly business. 'Nam? Smack? He explained why it was bad to drop out of school and how our lives would be ruined forever because we'd be poor and sad and stupid. He then pulled from his duffel bag a yellow novelty key as long as his arm, which he called "The Key to Success." "Does anybody know what the key to success is?" he said. We leaned forward in our bleacher seats, for we did not wish to be poor and sad and stupid. "A rich daddy!" somebody yelled out. "You got to have skills!" said another. "Like if you can weld!" someone clarified. The Key to Success is Welding? No, that didn't sound right. The answer, he explained, was on the back of his magical homemade wooden key. If only he would tell us! All would be known! Finally, he turned the object around, on which he'd painted, in all-caps, "SELF-DISCIPLINE." We'd been hoping for something more like "WIZARDS" or "KARATE." Those were at least things you could get your head around. Eventually, after a few historical anecdotes about the virtue of self-discipline, we acceded, yes, this rare quality would save us from a lifetime of sad stupid non-success. I couldn't speak for my classmates, but I didn't want a normal life. I wanted Greatness, Fame, Medals, the End of the Rainbow. Who can say why? This strange fire was inside me, that's all I knew. No man in my family had ever even finished college. A quarter-century later, my own American Dream came true. I became an author and the first member of my family to have his name said aloud on National Public Radio, which felt amazing, and would have felt even more amazing if anyone in my family knew what that was. I won a crystal plaque that's so heavy and beautiful I'm embarrassed to display it. I have an agent. I write books. It really is amazing to me, what my life is now. Occasionally, I get invited to high schools and colleges to inspire students, and I feel an overwhelming compulsion not to mask the truth with inspiring abstractions. The first hard truth: There is no single Key — it's more of an Unwieldy Keyring of Success, the jangling hoop your assistant principal wore like a medieval weapon. Which key does one use first? What if you don't even know what to be successful at? Medicine, or music? Business, or boxing? Do you follow the sure thing, or the passion? What if one is very passionate about sure things? How to choose? This is America, the greatest nation in the history of the world, alongside Rome and perhaps Iceland, and in this great land, your dream can take many forms. You can do something wholesome and productive, like practice medicine in a place where they ride llamas, or build mattresses that never wear out, or you can do something evil, like make another Spider-Man movie. I was nearly 30 before I finally eliminated all my options, which included forensic psychologist (thanks, "Silence of the Lambs"! ), weatherman ("Groundhog Day"), and disc jockey ("Good Morning, Vietnam"). The vocation of writing was a dark horse, emerging much later, after a nervous breakdown. Nobody warned me that I might be a husband and a father before finally learning what I was supposed to do with my life. One can be overwhelmed by all the career options, or one can embrace their dizzying innumerableness. That's why our first Key to Success is GRATITUDE AT HOW MANY CAREER OPTIONS YOU HAVE COMPARED TO YOUR PEASANT FORBEARS, by which I mean an awareness that for most of human history, your options would have been much simpler, back when you did whatever your parents did, which was usually to die of typhoid. If your mother was a subjugated washerwoman, then maybe, with hard work, you became a subjugated washerwoman-slash-leech-gatherer. Today, thanks to the Magna Carta, penicillin, and LinkedIn, there exist many kinds of subjugation to aspire to. Plagues no longer plague. Today, we are plagued with dreams. That's a blessing. You're probably good at lots. One must also possess A GENERAL TOLERANCE FOR LOWER BACK PAIN, because whatever you finally decide to be — even if you're smart and talented, according to your mother and/or your test scores — the actual manifestation of your dream will very likely not occur until you are at an age more associated with high blood pressure than youthful ambition. Every now and again, they do give Oscars to actual human babies, but these rare instances can damage the dreamer's sense of time and justice. How long would it take me to write a book? (I figured two years, three, tops. Stephen King said it should take about three months, which is how you know his real name is the Dark Lord Baphomet.) It took me ten years. Most of us are lucky to get three of the above, and if you're a single parent, you pretty much only get to pick two, and if you're below the poverty line, you'll likely have to work very hard for just one, which means that every dreamer needs A WILLINGNESS TO FORGO WHAT MANY AMERICANS FEEL THEY DESERVE AS A HUMAN RIGHT, because you won't have it all. Nobody does, at least not until they're very old, at which point you lose your health and all your friends die. While you're busy neglecting friends and family in pursuit of your dream, you're going to require A CLEAR-EYED RECOGNITION OF YOUR CAPACITY FOR HURTING OTHERS. Nobody tells you that your dream will turn you into a vampire, even when it's a perfectly honorable dream. (Talk to a missionary kid.) Your ambition, noble though it be, will compel you to treat your loved ones as means or ciphers via manipulation or neglect. The capacity for evil exists in every human breast, especially in the hearts of dreamers. Guard against it at every turn. The dreamer also desperately needs a venue for the celebration of small victories on the way to the big victory, which will never come, because dreams don't so much come true as evolve and reproduce, birthing new and more complicated fantasies. It’s hard to know when to stop and celebrate with that beer. Accordingly, one of the most overlooked Keys to Success is FRIENDS WITH A POOL. You need a way to indulge in modest healthy pleasures on the regular, because joy now is almost always better than joy later. Pools, porches, boats, beaches, riding bikes with your daughters with a stereo strapped to the handlebars, these are as essential to the American Dream as hard work. Don't forgo them. Easily the most necessary item on our clattering keyring is READINESS TO BE WHOLLY TRANSFORMED INTO A NEW CREATURE. Ambition led me down many dark roads and into sloughs of despond. Dreaming is dangerous business. My illusions — regarding talent, money, how much the world would love me, and how good a husband and father I was — were pried from my white-knuckled hands by time and truth. The dream broke me. You can fight the breaking, or let it happen and be remade, kinder, gentler, less vampire-like. I could go on. One also needs MENTORS, HEALTH INSURANCE, and PEOPLE WHO WON'T LIE TO YOU ABOUT HOW BAD YOU ARE AT THE THING YOU WANT TO BE GOOD AT, but how can one say all this to anxious and eager young students? It might make them sad and stifle their dreaming. When I climb the stage and take in the exquisite hunger of all those faces, I think of the angry man with the yellow key — angry, I think, because he knew how impossible it was to illumine the multifarious unknowability of the American Dream to any child. The dream is a beautiful beast, magical and miraculous, with many faces and eyes and tentacles, and I am grateful that it has generated reasonable financial security for my family and provided me something useful and beautiful to do in my short time on this planet. With hard work and even harder lessons and the enduring love of people who kept me from going full-vampire, I've found a way to tame the dream-monster and live a relatively normal and happy life, which is exactly the thing I always thought I didn't want. Funny how that happens. 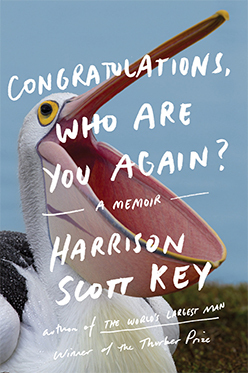 Harrison Scott Key is the author of "Congratulations, Who Are You Again?," from which this essay was adapted, and "The World's Largest Man."